A Novel–Nikki, had no idea that accepting an invitation would impact her life so thoroughly. Dinner and a movie thrust her into womanhood. There was no time for immaturity and nostalgia. She had to grow up, get it together and keep it together. She knew about abandonment from her mother. She knew about strength and coldness from her grandmother. She learned that love is best when somebody loves you back. When Somebody Loves You Back is the kind of book that you keep in your shoulder bag, purse, desk or at your bedside, so that it is readily available at your fingertips when you are able to grab a few minutes to devour some more of its pages. 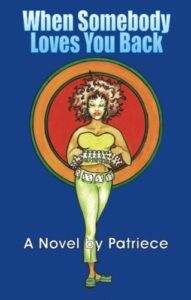 Patriece has the rare ability to create characters and situations that are believable and life-like, characters that have texture and depth. Not only are you engaged and drawn in to the book, but it also causes you to reflect upon your own life experiences.